Sonia has been in the beauty industry for over 17 years. Realizing her natural knack for the art of Makeup at an early age, she started working part time in direct sales for a Makeup company in 1997. Falling in love with the industry and wanting to do this full time, she then became a licensed Esthetician which opened up a whole new realm of knowledge beyond makeup. For the next 13 years she worked as a Medical Esthetician for one of the most well known Dermatology and Skin Care Centers in San Joaquin County. She was a public relations advocate for Dr. Prescott's Skin Care Centers by representing his practice with entities such as The San Joaquin County Hispanic Chamber of Commerce, "LA TRI-COLOR" radio station, as well as the television network UNIVISION. Throughout expanding her education as a Medical Esthetician over the years, she has been an Esthetics instructor at a local beauty school and has continued to grow as a Makeup Artist and Hair Stylist having attended schools such as the Makeup Institute of San Francisco, The Make Up Designory in Los Angeles, Bio Touch in Los Angeles, as well as attending Celebrity Makeup Artist seminars. Sonia never thought that pursuing Makeup would be such a big part of her life but with hard work, perserverance, continuous education, and her passion for service, she has become an established, well known Artist and Esthetician, one face at a time. 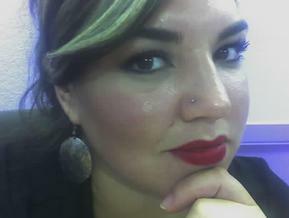 Book a free consultation with Sonia at BLUSH skin care & makeup parlor. a culmination of years of skin care and beauty industry experience gathered up in one place to offer you the absolute best skin analysis, skin care treatments, and makeup application! YOUR personal skin care therapist is ready to personalize a treatment plan for YOU! Committed to helping our customers achieve their BEST SKIN EVER!